I paint skin colors using both acrylics and enamels. 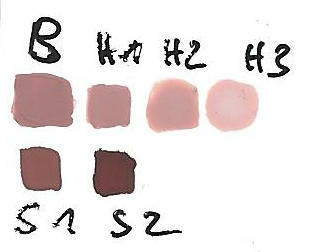 H1 – H3 are the highlight colors, resulting from mixing more and more 815 and 951 (White) to the base color. S1 and S2 are used for shadows. They are mixed from Humbrol 73 (Wine) and 110 (Wood) for S1 and 22 (Black) for S2 respectively. The highlight colors are heavily thinned and applied in layers. Painting with acrylics is all about controlling the amount of color on the brush, so always thin the color and get rid of excess paint by unloading the brush on a paper towel before approaching the model. The enamels are also applied heavily thinned and are immediately blended carefully using a clean brush moistened with turpentine.